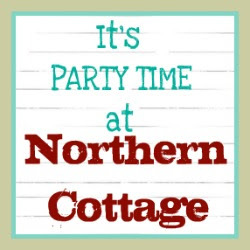 Northern Cottage: A Layered SPRING WREATH & a party! A Layered SPRING WREATH & a party! that I literally tore to shreds! ha! I’ve always wanted to do that! that makes me smile every time I open the front door! Your wreath is gorgeous-you did a wonderful job! Sorry to hear about your computer issues. Isn't it a pain when they don't play nicely! I just adore your wreath! Thanks for sharing it! And thanks for hosting the party! I love your wreath, I think the beautiful fabric adds 50% to its charm. Thank you for hosting! I LOVE your wreath and I think I will give it a shot!! What a cute wreath! Love it! Oh-my-gorgeous! I love that wreath. I found your party threw a link party. happy I did. I'm a new follower and I would love for you to come to my blog and follow me to. I just started a link party too on Sundays if you would like to come link up anything you have. That wreath is fantastic!! Thanks for the party! Thanks for linking up at my place! Love the wreath, its amazing what you can do with fat quarters. Thanks for sharing and for the inspiration to go dig in the craft room and see what kind of stash I might have to make your cute wreath. Gorgeous wreath, the layering is so pretty. Thanks for stopping by! Your wreath is a happy project. Thanks for hosting. Hi! I'm your newest follower. Gen from http://cabinfeveredgem.blogspot.ca/ ... a lot like Northern Cottage... except in Northern Saskachewan! I love your blog and am so happy I found it. I just liked uop 3 spring projects that I hope you'll enjoy. Come by for a visit sometime! The wreath is lovely and so Springy! Thanks for hosting another great linky, lots of lovely inspiration! Thanks for hosting. Happy first day of spring. Super cute wreath! Love the springy fabric you used! And the layers looks great together! Love the wreath! Thanks for hosting!! I LOVE your wreath! I love the fabric you chose. Thanks for sharing at oopsey daisy! This is my first time visiting. I am here via Jane's Cottage at the Crossroads. Your wreath is absolutely wonderful. I have clicked the Linky Follow and I added a link. Wow. You put a lot of work into that, and it shows. It is beautiful! Great wreath! It would make me smile every time I opened the door too! What a fun wreath - love the vintage mailbox peeking through the center!